If you're wanting football-themed decor, run (okay drive) don't walk to the Dollar Tree. 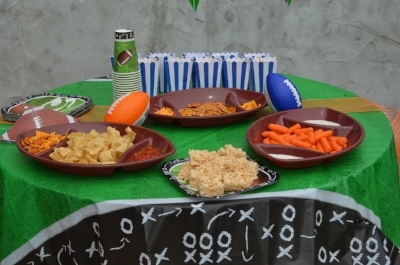 Right now they have tons of football-themed decorations from tablecloths, to banners, to football-shaped chip and dip trays. We put out the patio table, hung a banner, and assembled our goodies. You'll notice we did a little orange and blue for our alma mater, but Dollar Tree has a selection of mini footballs and treat bags in various colors. The food prep took minimal effort. We had to make the crispy rice treats, pop the popcorn, and then simply pour the other items into bowls. It took a total of about 30 minutes. The treats required three ingredients: rice cereal, marshmallows, and butter. The Millville Crispy Rice Cereal is similar tasting to the name brand and delivers tons of crispy crunch. We found it 96% similar to Kellog's Rice Krispies. We used Baker's Corner mini marshmallows, they were just as sweet as Jet-Puffed marshmallows and a little fluffier than the name brand (88% similar). We also liked the Aldi butter, and the dessert was a hit! Speaking of crunch, we got that with several salty snacks. We had pretzel thins and cheddar cheese in one tray and we were very impressed by Clancy's pretzel slims. All testers thought the taste was almost identical to Snack Factory. The main difference is the store brand is slightly smaller than the name brand, but at 96% similar, we would switch to save. One snack that didn't win over all the guests was the Happy Farms cheddar cheese, it has less cheddar flavor and is more rubbery than the Kraft cheese. Some testers/ tailgaters still enjoyed the cheese, so it earned a 63% overall similarity score. In the other football platters, we stocked chips and salsa, cheddar party mix, and carrots and ranch dressing. The Big Dippers chips are a little less salty and crunchy than Tostitos, but testers still enjoyed them and found them 64% similar to the name brand chips. Testers liked the spice and flavor of the Casa Mamita medium salsa. At 86% similar, we recommend you switch to the salsa to save. We also tested the ranch against the classic, Hidden Valley. If you like a very tangy ranch, you will like the Aldi version. If you prefer more of a buttermilk flavor, you should stick to the Hidden Valley. We are huge snack mix fans over here, and testers enjoyed Clancy's version of Cheddar Chex Mix. Texture and taste are similar, but the store brand mix has less cheddar powder than Chex. We appreciated the more natural flavor and gave it a 71% similarity score. Finally, we couldn't resist the cute favor bags at the Dollar Tree. At 5 bags for a dollar, we grabbed two sets for ten total and filled them with some delicious, buttery popcorn. Clancy's Movie Theater Butter Popcorn is just as salty and buttery as Orville Redenbacher. We did have to pop several bags because they don't have as many kernels as the Orville Redenbacher. If you want to pop a full bag, we suggest you stick to the name brand. We think our tailgate totally scored, if we do say so ourselves. It required little time, effort, and money. Now if only the coach would put us on the field.